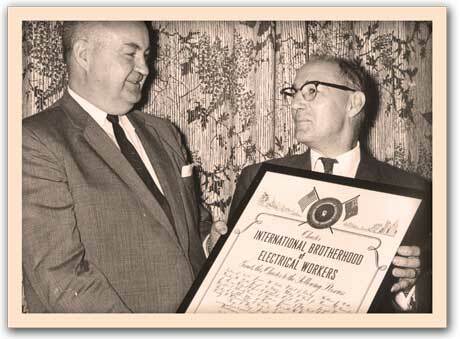 International Brotherhood of Electrical Workers has been striving to reach its goals of improving conditions for electrical workers since 1891, when 10 linemen frustrated with the pay, conditions, and fatalities of the trade, united to form this great union. The IBEW has a long and proud history in Baltimore and throughout the state of Maryland. Our predecessor, Local 28 was chartered on October 1, 1900, and served the city of Baltimore and surrounding counties until August 1961. Local 24 received its charter on August 27, 1961; the original charter resides in the lobby of the local business office and lists the names of the 27 original charter members. Local 24 was started with the help of a $25,000 loan from the International Headquarters, which was later repaid. The first business office of Local 24 was located at 225 W. Fayette Street in downtown Baltimore. It later was moved to 115 N. Eutaw Street, and in 1968 to Cross Keys. Our current headquarters building was erected in 1972. Recording Secretary: George Bley Jr. The first membership meetings were held at the Steelworkers Hall in Dundalk until the construction of our present building in 1972. In 1961, the pay rate for a journeyman was $4.05 per hour with 7 cents in health benefits and 1% for the National Electric Benefit Fund (NEBF). In 1972, the Local pension was started with a 10-cent contribution rate. The Journeyman rate was $7.15 per hour, and health benefits were 30 cents. In 1976, the Local annuity fund was started with a 25–cent contribution. The journeyman rate at that time was $10 per hour, the pension was 30 cents, and our health benefit was 60 cents. Our IBEW Local was not the first to have the number 24. It was first given to Minneapolis, Minnesota, which was chartered on April 24, 1892 and went defunct in December 1912. Local 24 then went to St. Paul, Minnesota, which was chartered on March 16, 1915 and went defunct in November 1922. It was then given to Oakland, California, which was chartered on October 12, 1933 and amalgamated with LU 595 on October 3, 1934. The number 24 finally came to Baltimore, Maryland on August 27, 1961, where it resides to this day. Local 24 has a satellite office in Salisbury, Maryland, which handles the business of the Eastern Shore counties, from the Bay Bridge all the way to Ocean City. The Eastern Shore at one time had its own Local number, IBEW Local 1835. Local 1835 was chartered on April 2, 1953, and merged with Local 24 on December 1,1966. At the time of the merger, Local 1835 had 110 members. The Eastern Shore operates under its own collective bargaining agreement. Local 24 represents quality journeyman sign workers and sign apprentices in the city of Baltimore and surrounding counties.The union sign industry in Baltimore at one time was represented by IBEW Local 250. Chartered on September 1,1963, Local 250 became amalgamated with Local 24 on April 1, 1973. There are currently two sign companies in signed agreement with Local 24.